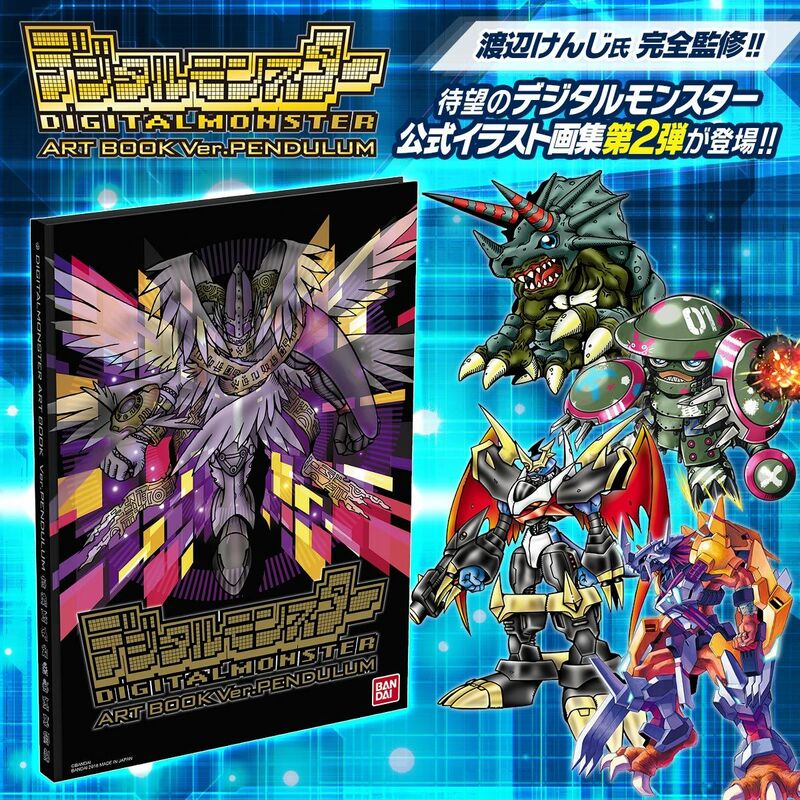 Digital Monster Art Book Version Pendulum Announced, Pre-Orders Open! Thread: Digital Monster Art Book Version Pendulum Announced, Pre-Orders Open! More Pendulum stuff to order! The 2nd Digimon V-Pet art book! Digital Monster Art Book Version Pendulum! This book covers the various Pendulum V-Pets, along with various making of and extras, so there will be a decent amount of material, in fact, it will have more content than the previous art book. The entire art book is being supervised by Kenji Watanabe. First up, the main Digimon art pages. The overall setup appears roughly identical to the 20th Artbook from last year. This book covers Nature Spirits thru Virus Busters, covering the entire original wave of Pendulums. The 20th Pendulums are also included. 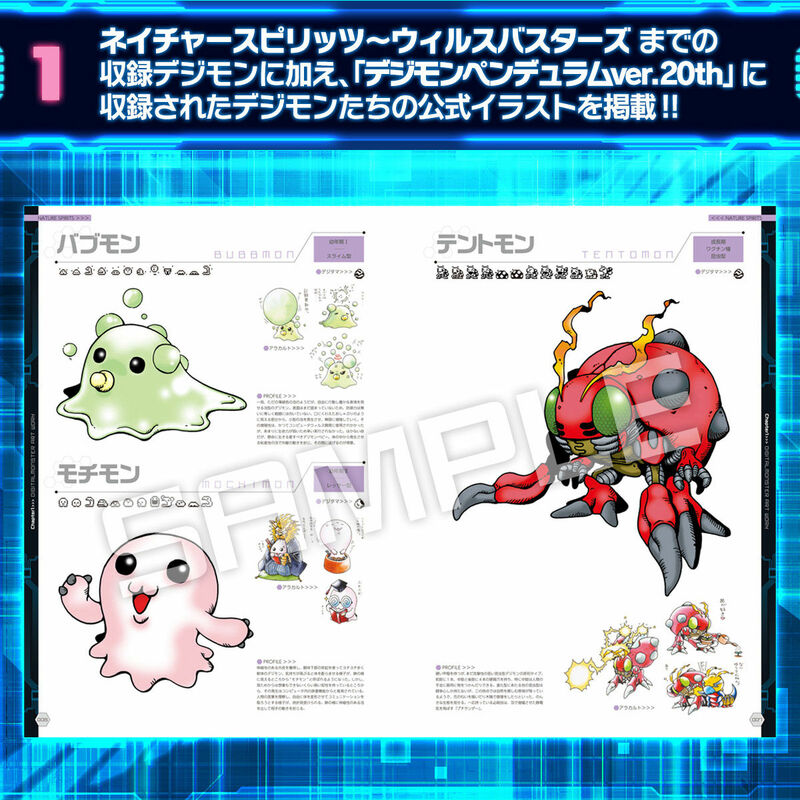 They mention that including the 20th Pendulums, there are illustrations of roughly 300 Digimon. 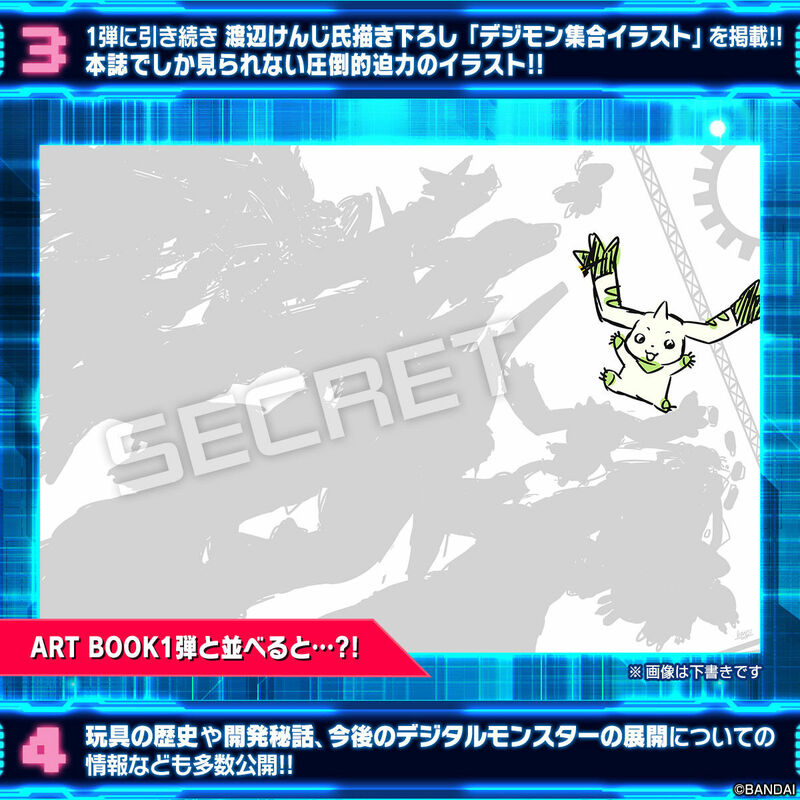 They mention that Digimon who appear in the first art book will not be included. We get stuff from the Digimon Pendulum X series! The first appearance of the X-Antibody Digimon. 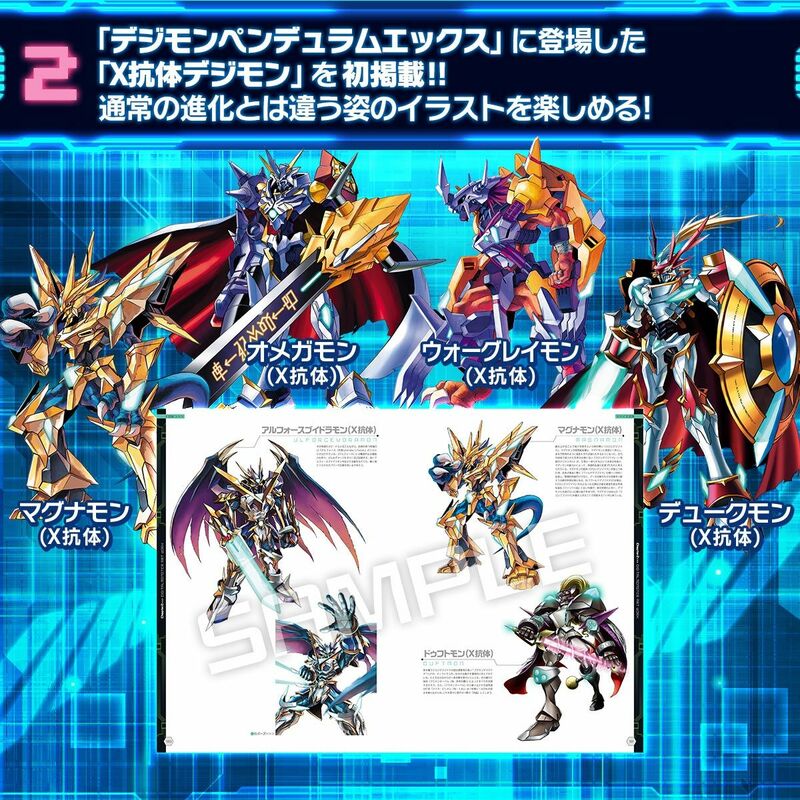 They hope we enjoy the illustrations of these Digimon that appeared thru a method that different from normal evolution. Another big celebration image by Kenji Watanabe for the book! We only get a small preview here, but a few other Digimon are recognizable... plus they tease that it can go side by side with the image from the first art book. The last bullet point gets no image, but they tease a number of additional sections including: history of toys, shedding more light on the Folder Continent, development stories/secrets, and showing off information on the future development of Digimon. There will be 240 pages and the pages will be A4 size (8.27 x 11.69 inches.) The book will be hardcover with a reflective foil cover. Pre-orders for the Pendulum art book are open at Premium Bandai. They will be open until August 23rd for 4,860 yen. It's scheduled to ship in November. Of course, the 2nd wave of 20th Anniversary Pendulums is also being released. Update- MonMon Memo will have an introduction to the new art book next week, along with talking about the Legend Arms that came in the Version 20th. Each winner will receive a Digimon Pendulum Silver Blue or Silver Black (random), plus the Digital Monster Version 1-5 & 20th Art Book, signed by Kenji Watanabe. Ooh. I really regret not getting the original 20th artbook. I'll have to get on this. Going to definitely pick this up! Loved the Vpet ver 20th Anniversary artbook and I’ve always wanted to own the old Pendulum artbooks too. Wonder why they choose MagnaAngemon to be on the cover though. Anyways, missed the other artbook, might have to get this. Yeah it's weird that they went with Holy Angemon and not like, Triceramon or something. Maybe Holy Angemon's more popular than I realized? Anyway, more Digimon art books! Always great to see, and a Pendulum book was just a matter of time. Well, MagnaAngemon would sure be more popular/recgonisable than Triceramon at the least. This makes me so happy! Especially the X antibody art. Last year's V-Pet art book was one of my most pleasant fandom surprises of 2017, so a sequel is great news. It's nice to know that there won't be any duplication of artwork between books (it's what's expected, but it's still nice to hear). I bought last year's book, so this is a must-have. Keep 'em coming! I won't be buying the 20th Anniversary Pendulum itself, though. I already got the Zubamon 20th V-Pet last year (and I still haven't actually played with it yet...); one's enough for me. Last year's book was also the first time I'd ever used an intermediary service. I'm... not a fan. It got a little pricey. I still wish they'd put these things up on Amazon Japan or something, but Bandai's always been like this. I suppose I'm willing to bear with it as long as they only do these things once a year. From Japan got my items to me in one piece last year, so I guess I'll be going with them again. Updated with details of a contest and that the art book will be shown off in MonMon Memo next week.